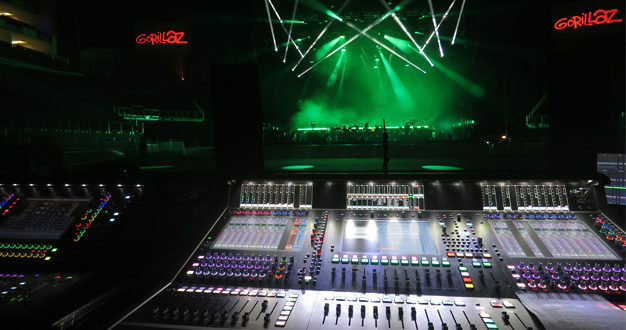 FOH engineer Matt Butcher and monitor engineer Dave Guerin have recently been relying on DiGiCo consoles for the Gorillaz’ huge live shows. 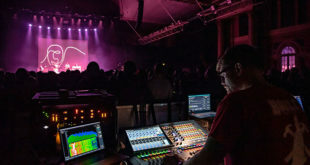 The FOH and monitor consoles – both DiGiCo SD7s – are maxed out, while a SD11B is deployed for the shout system. 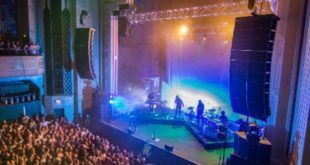 In addition to Albarn, who’s on guitar and grand piano, there is a drummer, a percussionist, a bassist, guitarist, two keys players, six BVs and, for the London show, five ‘hypnotic’ brass, and a five-piece string section. 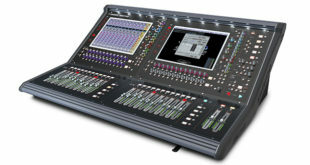 Every show is recorded using 128 inputs and a DiGiGrid MGB running off two MADI streams at 48kHz. 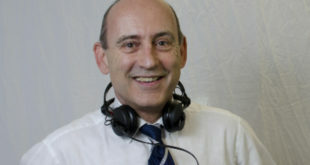 “The small faders are my output, but other than that, it’s all the same as Matt,” added Guerin, who is running a massive 192 inputs. “With this sort of sized show, we have to be on top of things,” Butcher explained. “Dave writes the spec, and we all add to it. Rack-wise, we have three SD racks and one [DiGiCo] Orange Box, and that’s got two MADI outs – it is the digital in for the keys and tracks, and sends for record. So we’re patched for that as well. Gorillaz was formed 20 years ago by Blur frontman, Damon Albarn, and Jamie Hewlett, co-creator of comic book, Tank Girl. Gorillaz’ self-titled debut album, released in 2001, sold three million records and earned them a place in the Guinness book of Records as Most Successful Virtual Band. Gorillaz will hit the road again in March, heading to South America for the next leg of their tour, playing in Mexico, Chile, Colombia, and Brazil; and will play a string of major European festival dates this summer.